Donald Takayama's TERRAMAR longboard model. Nice TERRAMAR in and all turquoise semi-opaque tint, gloss & polish finish. Black and white Takayama oval and ocean tern logos. Concave nose with a big 3/4 deck and swept wedge fin patches. Single 3/8" Redwood stringer. Single fin box with Takayama fin included. Length: 9' 2" Width: 22 3/4" Thick: 2 7/8"
Nose: 19 1/8" Tail: 15 1/4"
Originally a team rider exclusive, the TERRAMAR has a flat nose with a strong tail kick for staying in the pocket to noserider longer and turn better. 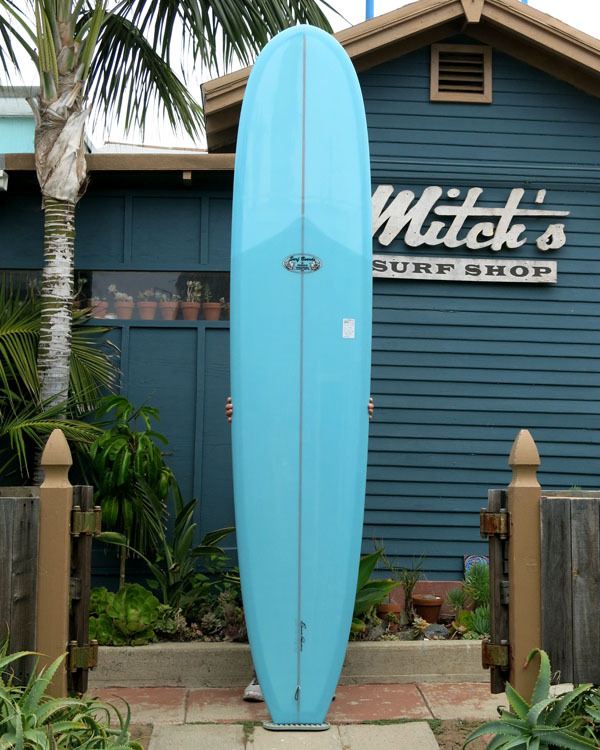 Uses classic single fin heavier foam and glassing.